We first woke up around 6 am; the rain was still falling and I discovered some had managed to enter the tent. The sheet we used to cover the mattresses was soaked at the corner that approached my feet. Knowing the wet portion of the sheet would become larger worried me. I didn’t want my sleeping bag to become wet. I folded the wet portion under the mattress as best I could. The lower portion of our tent had small puddles around our baja bags and our fanny packs. Thankfully, we had protected items in the fanny packs that could be damaged by water, and the baja bags were waterproof. With no desire to get out of bed, we both fell back asleep until around 10:30am. By 10:30am the rain had stopped, and we had a quick breakfast and packed up. Shortly after leaving the point the rain started to fall again – not hard, but enough for us to don our raingear. The wind was coming from the north-north-east; this picked up my spirits as it would only be a headwind for us for a short distance of our route. 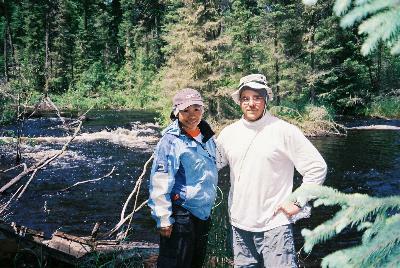 We quickly passed through the creek, and the waves on the unnamed lake helped push us along to our first portage. This was the 550 metre portage that was almost all downhill as we travelled towards Indian House. Knowing it would be almost all uphill in this direction, and that it had rained all evening dampened my mood; on the upside the food barrels were lighter. By the end of our second trip, I was breathing heavily; the rain had stopped and I was sweating in my raingear. I removed my raingear, and we loaded the canoe. We pushed off and took a short break. Knowing what was coming up shortly, we seemed to paddle a little slower. Reaching the swampy portage, both my wife and I both wondered how wet it would be after the rain last night. As it turns out, the trail was covered with more water, but the water felt rather cool and refreshing. Now that our food was lighter we only made two trips each portage; two tripping made this portage seem less of a burden. The rain also raised the water in the creek that gave us some trouble when we passed through on day three; we pass through with far less trouble, and reached the third portage quickly. This was our third portage in less than two hours. I’ve begun to understand why some experienced trippers like fewer but longer portages over more frequent shorter portages, loading and unloading started to take a toll on our bodies. Without difficulty we reached the shores of Crystal and began our southern passage down the western arm of the lake. As we started our turn towards the east and the portage into Bell, I angled the bow of the canoe to the northeast to keep the waves from broadsiding us. As we approached the eastern side of the lake the waves became smaller in size, and we paddled directly to the portage. As we passed the location along the portage where we stayed the second day, thoughts of the wind and waves from that day returned to my mind. I started thinking that perhaps the waves weren’t too large, and that we could have crossed Crystal. Our confidence had definitely strengthened. The Bell end of the portage was sheltered from the wind and we stopped briefly to refill our water bottles and have a snack; it was already 4pm. As we pulled away from the portage I gave Tuch two options, we could either stop at Page again or head for the campsite at the end of the Peterson/Hatchet portage. She didn’t commit to one or the other so we just paddled on. We casually paddled through the rest of Bell, the creek and the small unnamed lake. When we reached the short portage along the creek leading into Page the water was pouring over the dam in places it wasn’t on the second day. Quickly across the portage we loaded the canoe and started making our way downstream in the creek towards Page. The higher water levels, and the current sped us along into Page. The two gentlemen from Wisconsin mentioned they stayed on the western shore of Page just south of the portage; one mentioned it wasn’t very inviting. Looking at it as we passed, I came to the same conclusion. One had mentioned they quickly discarded the idea of camping at the location we had stayed at; I’m sure had they stopped to investigate they would have liked where we stayed more. As we rounded the point around which the Page campsite was located, I asked Tuch if she would like to stop. She asked how much longer it would be to the Hatchet site. After explaining we only had Page and Peterson to cross and two more portages, she didn’t mind continuing. With a fair tailwind helping us, and the overturned aluminum boat marking the beginning of the portage into Peterson, we had no problem crossing Page directly to the portage. As we unloaded the canoe I recalled the passage of the storm on our first day; I heard once again the roar of the thunder, saw the bolts of lightning, and felt the wind as it raced across the lake, carrying with it the heavy rain. With memories of the previous days filling my mind, we finished our second passing on the portage. As we started to load the canoe, my wife and I each heard a huff. I asked my wife if she had said something, she replied no. She asked me, and I informed her I also had said nothing. I turned to look back on the portage, but could see nothing. Something was in the forest out of our sight, but it knew we were there. Tired, and in no mood to find out what had made the sound, we expedited our departure. With only one lake left to cross, and one portage left to travel, I started thinking of tomorrow. What would it hold in store for us? As we pulled up to the portage leading to Hatchet, my only desire was to cross the passage and set up camp. With almost 20km traveled today, including seven portages, I was ready to go to bed. With my wife in the same mood, we set up camp, ate a quick dinner, and went to bed. After a good night of sleep we woke up around 7am; I knew we didn't have far to go so we took our time eating breakfast and packing up our camp. While we were eating, small breaks in the clouds would occasionally allow the sun's rays to reach the ground unabated. I hoped this would be a sign of things to come as we hadn't seen the sun since early afternoon yesterday. At 8:45am we left the northern shore of Hatchet, and began our short paddle to the portage into Upper Hatchet. The sky had cleared to the point where it was only partially cloudy; the sun felt good, and I hoped it would stay out for a while. We both had wet clothes that needed to be dried; with less than 10km of paddling left and only two portages totalling 850m I figured we would have plenty of time to hang our clothes up to dry once we reached our desired camp. With only about two kilometres to paddle, we reached the portage at a quarter after nine. Water could be heard trickling down the portage path a short distance from the landing area. Looking at the topographic map I realized the first bit of the portage would be steeper than most in the park; with sore muscles, and a muddy wet trail to contend with, I was worried one of us may take a spill. As we climbed the portage the water continued to trickle in a pool and drop manner. Near the beginning of the portage I was trying to avoid the pools; I didn't want to step in one and find out it was deeper than I anticipated. After a few missteps, I found myself in a couple of the pools; they were shallow, and the water was very cool. Rather than spend my energy avoiding all the pools, I decided to chance it and began walking through each of them. My wife was still avoiding all of the pools. Close to where the portage trail leveled off, we found the source of the water; the water was coming out of a crack in the rocks to the right of the trail. After we passed the source of the water the trail dried up, other than natural features causing the trail to rise and fall slightly the portage flattened out nicely. At a few spots along the trail we spotted what appeared to be caribou droppings. Close to the end of the portage, the trail quickly descended to Upper Hatchet; this end wasn't as wet, but there were a few small trees to contend with. Not wanting to walk the portage on three round trips we attempted to carry the rest of our goods on our second trip. We hastily attached our baja bags to the food barrels, and started walking; in our haste, we didn't do a very good job attaching the bags to the barrels. As we climbed the slope of the portage the baja bags shifted, and the effort required to finish the portage increased. We were both breathing heavily by the time we reached the end of the portage. There were two motor boats at the end of the portage; one was half full of water. It appeared that Upper Hatchet was much lower than normal; the high water mark on the shore was more than a metre above the current water level. I wondered why. None of the other lakes we had been on showed this much of a difference. We loaded the canoe and started out of the bay towards the main body of the lake; just outside of the bay we encountered our second group of people, they were just starting to load their canoes on a small island to the north of our route. The island didn't look inviting; while it lacked many trees, it had numerous seagulls. We quickly passed the island and continued across the main body of the lake; our trip was aided by a moderate tailwind. We approached the northern end of a large island close to the middle of the lake, the signature series study of WCPP showed this island as a caribou calving location. Not wanting to circle the island to see if we could spot any caribou, we continued into the bay where the portage into Embryo would be located. 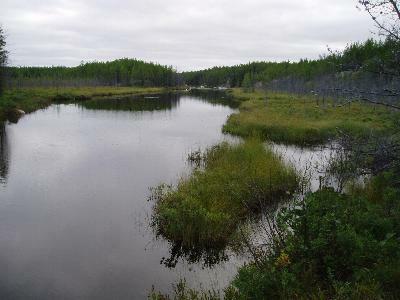 The portage is located in the northern section of the bay, a short distance from the furthest point in the bay, and next to an old beaver lodge. As we unloaded our canoe the group from the island entered the bay; my wife and I started our first pass of the portage before they approached the portage. Although the terrain along this portage was easier than the last, a little fatigue made it seem more difficult than it actually was. This was our second 400+ metre portage in under an hour. Carrying packs on my back wasn't so bad, but the canoe was hurting my shoulders. When we returned to the start of the portage the group was waiting in the water; they must have decided to let us finish before starting. They were younger than us; and I hoped they weren't planning on stopping at the same site we planned on stopping at. If it came down to a race, I don't think we would win. I nodded, and a couple of the guys waved back. My wife and I loaded up again and started across the portage our second time. I kept on thinking the other group would catch us on the trail, but they didn't; as we were just putting our canoe into the water the first of the group appeared. He asked where we were from, and I asked him the same in turn. They were from the twin cities. He then asked how long we had been in the park; he looked a little disappointed when I told him it was our sixth day. It was only their second. It was my turn to be disappointed when he told me they were on a twenty three day trip; they'd still be in the park when I would be back at work. This end of the portage had limited space due to the cached boats; we loaded up as soon as possible and were on our way. With the wind once again at our backs, I decided to cross the lake in a direct manner; the path took us away from the shore, but I was unconcerned as the weather was fair. We looked back to see where the other group was; they were skirting the northern shore. Their route was safer, but it allowed us to put a little distance between us and them. The first site marked on our map was located on an island, slightly less than half way long the route of the lake. This wasn't our preferred site, but since we would be passing it, we decided to check it out. If it was exquisite we would stop. As we approached, a loon starting feigning injury; it was trying to draw us away from the northwestern end of the island. It allowed us to get closer as we paddled towards the southern end of the island; we were close enough that I decided to try to take a picture. To my surprise, just as I released the shutter, the loon brought its body out of the water by flapping its wings a few times. The picture turned out well. Content that we posed no more of a threat to its young, the loon returned to the northern end of the island. We rounded the southwest corner, and came to where the site likely was; there were a number of large trees down, so we quickly disregarded the idea of stopping. Our check of the island site allowed the group behind us to close the gap to less than half a kilometre; with approximately 2km to the site we preferred, we didn't want to be passed. Looking ahead to my wife, it appeared she wasn't in the mood for a long day; I also was hoping for a short day today. We kept the distance between us and the twin cities boys for the first kilometre, and over the last, the distance increased. They must have slowed to look at something. We approached the likely spot of the second site; it also didn't look too inviting upon first glance. The area had succumbed to fire not too many years before, as a result all the trees were immature. Upon landing our canoe and unloading our gear, the site began to look better. There was a fair sized clearing along the shore, and through a small opening, a second clearing provided a suitable site to raise our tent. We were both Hungry and in the mood to go fishing, as my wife cooked lunch, I set up the tent, fly and tarps. The twin cities group passed our site enroute to the creek between Embryo and Lac Lammont, I waved and a couple of them waved back. Shortly after lunch, we decided to try our luck in Lac Lammont; the brochure from the MNR listed Walleye in the lake and we hadn't tried for them yet. As we exited the creek into Lac Lammont a motor boat came around the corner of the lake; they were kind enough to slow down as not to produce a large wake for us to contend with. Each of the men in the boat had a beer, but I could see no fishing gear. I knew by the topographic map that Carl Lake drained into Lammont through a small stream. We decided to try fishing just off the shore in the current casued by the stream; we tied a crude rock anchor to hold us in place, and started fishing. After a few minutes my wife had a large walleye on her line, but as she was bringing it in, it made a run below a submerged branch and her line snapped. After numerous snags I was annoyed and suggested we see if we could get into Carl Lake; we landed our canoe and walked the 30m or so to the top of the creek where Carl emptied into. We decided just to try our luck in Lammont again, but I positioned us about 20ft further out from the creek mouth. I dropped my line with a jig and plastic minnow to the bottom, and reeled it in slightly. After a few jerks of my wrist I felt a nibble; I set the hook and brought a nice dinner sized walleye to the surface. We got it into the canoe and my wife put it on the stringer. Shortly after, my wife caught one of her own. The action stopped after she caught hers so we decided to clean the fish and return to camp for a walleye dinner. My wife cleaned the fish on Lammont and we returned to our camp site. While we were gone our tent became deformed; with so few large trees, I had tied the tarps to rocks and low trees. The pressure of the tarps bent two of the couplings on the tent poles; the tent still stood, but it wasn't too pretty of a site. As I attempted to fix the tent, my wife fried the walleye. The sky was clouding over again, so I took down our almost dried clothes off the clothesline we erected earlier. With not much else to do we looked at the map to see if we would stay put or move on tomorrow. With only three days left we decided we would go to Onnie tomorrow. If we reached Onnie we would only have approx 8km of small lakes and streams to reach to extraction point of Johnson. By 8pm we decided to have a cup of hot chocolate with some schnapps, and a snack, shortly after we went to bed.